In Case Notebook™, you can add a header and footer to each page of a printed transcript. Headers and footers can help you view transcript information, such as the deponent’s name and deposition date, when printing selected pages. An example of a transcript heading is outlined below. Open the transcript you want to print. Click the Print arrow on the toolbar above the transcript and click either Print Preview Full-Sized or Print Preview Condensed on the menu. The Print Preview dialog box is displayed. Click the Properties icon, shown outlined below, to display the Page Setup dialog box. Click the Page tab, shown below. 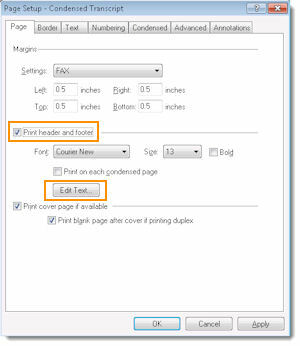 Select the Print header and footer check box. Click a different font and size in the Font and Size lists and select the Bold check box, if desired. Click Edit Text. The Header and Footer dialog box is displayed. Click Header 1. The Top Header Line dialog box is displayed, shown below. Type your information in the boxes. To add field data to a box, e.g., case matter information, click Insert Field and click a field on the menu. Click OK. The Header and Footer dialog box is redisplayed. Click Close. The Page Setup dialog box is redisplayed. Click OK. The transcript with the header is displayed. Click the Print icon to print the transcript.